In this quick-start tutorial you will learn how to configure free, auto-renewing SSL certificates for WordPress websites that are hosted on Google Cloud Platform compute engine using the Bitnami version of WordPress on Google Cloud Platform. Reserved a Static IP Address for your VM instance. Once inside your Compute Engine, click on the SSH button to connect to your WordPress installation. 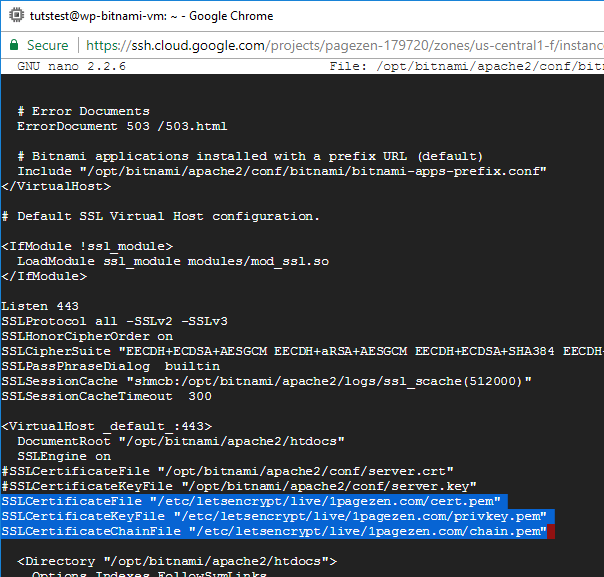 Now that you’ve connected to your website’s Apache server, you are going to execute the command to install the Certbot client. The Certbot client is used to issue the SSL certificates that will be used later on in this tutorial. After executing each of these commands, you can either stay in the same SSH window or exit and open a new one. In this step you are going to execute the command below in order to tell the Certbot client to create SSL certificates for your website. Remember to replace 1pagezen.com with your own domain name. After entering these commands, your certificates will be generated. Take note of the directory where your certificates are installed. Note: Instructions for testing the certificate auto-renew script were moved here. Before setting up auto-renewal for your certificates, you are first going to execute the commands below in order to test the auto-renewal function. If you get a success message, it means that the certificates are renewing properly. Important Notice: The auto-renew configuration instructions outlined in this section are no longer valid. For updated instructions on configuring auto-renewal, click here. (It is recommended that you skip to step 6 and finish this tutorial first). In order to program your certificates to automatically renew themselves, you need to configure a crontab that will automatically renew the SSL certificates before they expire. After entering the crontab -e command, choose the text editor to use to create the crontab. Nano (1) is the easiest text editor to use. Now that you’ve created a new crontab file, scroll to the bottom and paste the commands listed below. The command will tell Certbot to check for renewals twice per day. After adding this code, enter ctrl+o to save changes, followed by ctrl+x to exit back to your home screen. The next step is to configure your certificates. First, execute the command below to open your bitnami.conf file for editing. Next, paste the following 3-lines of code below the DocumentRoot line of the bitnami.conf file. This will tell the server to always serve your website's pages with HTTPS encryption. Remember to replace 1pagezen.com with your own domain name. (Update 03/08/2018: 'permanent' added to code to mark redirect as a 301 instead of 302). Next, use the down-arrow key to scroll down the page. Place a # sign next to each of the two placeholder certificates, and paste the path to your three SSL certificate files as shown in the command below, making sure to replace 1pagezen.com with your own domain name. Changing your website URLs via Settings > General is disabled in the Bitnami version, so you'll need to change your URLs by editing your wp-config.php folder. Inside of your wp-config.php file, you will need to replace your SiteURL and HomeURL definitions as shown below. In order for your certificate changes to take effect, you need to restart you Apache server by entering the command below. Now that you've completed the tutorial, you should configure your certificates to auto-renew using this tutorial. 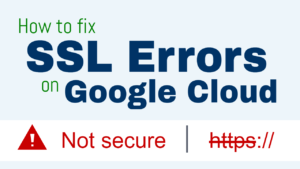 Also, if your configuration isn't working properly, check out the tutorial below to learn about common SSL errors and how to fix them. If your SSL certificates were configured properly, you will notice that your website is being loaded with a green padlock icon. To configure certificate auto-renewal, please view the tutorial here. The certificates are configured correctly, you just need to fix the insecure content errors. Hi Rob – when and where are you seeing this error? I have the same error message. This happen, after I installed the cerbot (finished step 1 to 4) and after running set 6 (jumped to set 6 from 4). This message appears. This error shows in the terminal? This site can’t be reached http://www.ovalkart.com’s server IP address could not be found. How is your DNS configured? Are you using Google Cloud DNS or are your just pointing your domain to your website’s IP on Google Cloud? Let me know and I will see how I can help! Can you first tell me if you are updating the content of this (Bitnami SSL) page or are you just responding to comments? Example: no mention of updating the Lego client. Note: i am trying update my SSL cert (again, cause cron cannot for whatever reason). Every time I come back to this issue it is a rabbit hole of confusion. Sorry to hear about the confusion! Use this tutorial for auto-renewal instructions. If you end up using the Lego client, remember to configure the rewrite directives in your bitnami.conf file. I have made a very silly mistake while installing the ssl certificate. Web address still shows the connection is not secure. When I view the certificate, it shows that it is issued to example.com instead of my domain address. Now I am not sure what should I do. Should I re install the certificate or is there any way to change it? A quick solution is to simple re-execute the certificate issuing command with the correct domain name. After doing this, a new certificate will be issued for your correct domain name. I am getting below exception could you please tell me which step I have missed or implemented incorrectly. Whenever GCP calls, I turn to you 🙂 Whole site up and running via your tutorials. Thanks. Just cropped up a small issue and thought I might ask the expert. My site is working fine and no issues with SSL. I have a reserved static IP but when I click on the IP, it provides me an ssl version of the ip link, but isn’t secure and an error shows saying NET::ERR_CERT_COMMON_NAME_INVALID . However, non ssl ip directs it to my ssl site. Just a bit confused. Hope you might extend a helping hand. The error is happening because you can’t register SSL certificates for IP addresses – so when you access your instance via it’s IP, it’s throwing an error because your IP address is not listed in the SSL certificate. This is expected behavior. You can configure a re-direct in Apache to forward traffic from your IP address to your domain name – see here. Let me know if you have any questions – and I’m glad you’ve enjoyed the tutorials! Hi, Thank you for your videos. I have done the tutorial and and I received this error when I tried to restart the apache. I followed all the steps. But post this update, my website is not loading. It is giving HTTP 500 error. On the 7th step, the code above and below “define” statements look little different for me than yours. I’m not sure if this is causing the problem. I’m seeing the define statements inside the if loops in my file. Whereas in your video, the define statements are above the if loop. Please let me know how to fix this error. Thank you. The ‘define’ statements were copied and pasted from the section of code a few lines above, and then uncommented (see the second screenshot from step 7). If the ‘define’ statements are in a different location in your config file, then just go with it – it is unlikely that this is causing the 500 error, except in the case of a syntax error. Hello I got this error to install the ssl certificate. please take a look and I am waiting for your reply. Don’t enter ‘c’ when it asks for an email address – that cancels the certificate issuing process. If you don’t want to provide an email address, just put in a placeholder address such as example@example.com. When I try to install certificate get below error when installing python. I don’t know what that error is about. There were multiple comments on January 23 from users who were experiencing a similar issue. By the way, were you able to get the issue resolved? There appears to be an error on line 90 of your bitnami.conf file. From there, look for the error. From my understanding, there should not be a ServerAlias directive in line 90 of the file (as the error message suggests) – it should be toward the top of the file under the opening tag. Thanks Leron, I was able to set up SSL on my site expressionbreak.com easily with the step by step guide you have posted. I would like to know how do I change the default user name that bitnami gives ? Couldn’t find a post on it. Which username were you hoping to change? The WordPress username? PhpMyAdmin username? SSH username? I have Followed the tut, but after that I got a Curl error: 56 (RECV_ERROR) when sharing to Facebook(Image is no sharing) how to resolve that issue? The worst part of it is that I can’t even acess my admin dashboard. I’m using google cloud platform. Was your website working fine with your domain before you configured SSL? Yes, it was working fine before I configured SSL. I don’t think I ran this command: sudo apachectl configtest. I think you didn’t run the command in the video, or did I skip a step in the video? The configtest is just to test for syntax errors – it’s only necessary for troubleshooting. Were you able to get it working? Did you find the problem? sir after ssl certificate process done. When I tried to create another instance. No:of:certificates issued error came what to do ? Please post your question in the WordPress Cloud Hosting Support group, as I’ve been unable to access your site. Will this tutorial work for AWS EC2 Instance as well. I have used WordPress Bitnami Client for my site, issued the certificate but not able to connect with ELB or Cloudfront. Yes – the process is the same for configuring SSL on an AWS EC2 instance. However, configuring the certificates with ELB or Cloudfront is a completely separate process, and one that I don’t cover in this tutorial. I would check the AWS documentation for additional information. Try re-running the command by copying the snippet I posted above and see if it works. Also, you’re using Bitnami and not Click-to-deploy, correct? Those are insecure content errors, and I go over how to resolve them in this tutorial. You might give this plugin a try. I’ve never tested it, but it has great reviews, so proceed at your own risk. Hey Jeison – thanks for the feedback – I’m glad to hear it worked for you! Try restarting your Apache server and see if there are any error messages that print to the terminal. Also, check your Apache error logs for any additional information that could pertain to the error, and make sure that your cloud DNS is configured properly and that your A record IP value matches the IP of the instance that is running your website. i will try these two options and let you know. thank you Joe for your help. You Are really Awesome! You Become My Cloud Guru! hi one page zen , thank you for your great help to all of us. i followed your steps precisely and it seems that all pages are secure except the homepage. is something i can do for it? 2. there are some redirects from the ip url to my domain name url , is there a way to cut them off as it lowers the loading time. You can run a find and replace query in your WordPress database table, as shown here. If it’s only a few images that are affected, for instance, then you can simply delete and re-upload them. Regarding the homepage issue, check out this tutorial on diagnosing insecure content errors. It seems that some parts of my page , pictures were the problem. they had ip instead of domain name, i changed it and it passed. Thanks for another amazing tutorial. My installation went smooth thanks to your straightforward step-by-step instruction. I can see “The connection to this site is using a valid, trusted server certificate issued by Let’s Encrypt Authority X3” notification in Google Chrome therefore the SSL seems to be working fine. Whereas, via my SEO plugin in WordPress I’m getting 404 Errors from .well-known/acme-challenge/h-vsCtyrnRYOeV2kj0qlQy1V59b3aKouDu8P address. What do you think the potential issues related to this server message? Thanks in advance. The acme-challenge is created on your server to validate your ownership of the domain (that you’re securing with SSL) before a certificate can be issued. For instance, if you tried to issue a certificate for a domain that wasn’t validated/connected with your server, the acme-challenge would fail. I see this happen a lot when users copy and paste the certificate issuing command directly from the tutorial, and forget to replace 1pagezen.com with their own domain names. That being said, if your plugin is showing a 404 from the ‘well-known’ directory, I wouldn’t pay any attention to it. It has no real value to your website aside from it’s role in domain validation for the Certbot client. Don’t delete the directory though, as you will need it when you run the command to renew the certificate later on. Thanks for your reply. Actually I have recently changed the domain name and the old domain is (301) redirected to the new one. Should I suspect 301 redirection might cause this 404 behaviour since .conf files seems to be configured correctly. Yes, the redirection could be causing the 404 error. You should at some point run a ‘dry-run’ (see the section of this tutorial titled ‘Basic Auto-Renew Testing’). After running the command, see if you get an error related to the Acme challenge – as this could be caused by the redirect. If not, don’t worry about the 404. I’ve run the test and got “Congratulations, all renewals succeeded. The following certs have been renewed” message without any error. As you suggested earlier, I’d just ignore 404 now. Thanks for the support. I have Followed the tut, but at the last point I got a failure. As the error indicates, there is a syntax error on line 13 of your bitnami.conf file. You will have to open the file, identify the error (jump to line 13), and fix it. Things to look for are extra spaces at the end of line 13 (these must be removed), and typos or missing spaces between words. You are the man. Thats all i got to say here. But for the rest of the people here, worked like a charm! One Page Zen always provides! Don’t run the the certificate issuing command as root. After verifying these two things, you’ll be able to run the certificate issuing command successfully. I have been using GSuite, since the program started as Google Apps. I decided to migrate to GCP in order to be able to create the site I really wanted and to learn as much as I could. Your tutorials have been my mind saving lifeline. I appreciate the time, effort and energy you put into creating these tutorials. You are a master educator and VERY good at what you do. For you, I am grateful. Thank you so much. You may already be aware, but your instructions say to use cert.pem, which will break apache2 on any reboot (requires manual passphrase entry, and if you’re using GCloud and bitnami over BASH SSH you won’t see the dialog (plus I don’t even know how to find the passphrase from certbot, which is my own fault for being a noob, but still ridiculously confusing). Should use fullchain.pem instead. Thank you for the detailed steps. I’ll be contacting you soon to ask your assistance in cleaning up the mess I made ;). I only needed one certificate for one site on my WordPress Multisite Bitnami to install on Google Cloud Platform. I was hoping this would still work. Needless to say, it’s created some problems. The good news is that my Google Search results from my old site are successfully redirected to the new WordPress site. The bad news is I can not log into my Multisite install to fix the mixed security issues. I’m only posting the pubicly so others don’t make the same mistake I did, or at least know what will happen. Thanks for the words of wisdom. I’m sorry to hear about the login problems, but hopefully this will be helpful to users who are going down the same route. I’ve already commented on the earlier version of your SSL installation guide. Anyhow, I’m listing my issue here as well, in case you prefer to communicate via the updated installation guide thread. Connecting to dl.eff.org (dl.eff.org)|151.101.0.201|:443… connected. 2018-08-22 04:39:21 ERROR 503: certificate has expired. You didn’t do anything wrong – there is an issue with the Certbot download site that is currently being addressed by their team. Thank you for your tutorial, I followed all your instructions but then I am unable to see anything after installing the SSL as per four instructions, all I see is a white page now, I cannot even access the WP admin anymore. could you please help, sorry about this. If your website was working fine before the tutorial, then the problem is likely due to a syntax error. If so, what were they? If you don’t remember, try re-executing the restart command. i have a problem… i did this tutorial and it is working great, i had another page on wix which i replaced with this one. i have pointed my other domain to his page and when i try to go to a page from my other domain it says it is not secure. i would really apreciate your help! All you need to do is configure domain forwarding through your domain name provider – you don’t need to add SSL to the secondary domain. If you need to instructions on how to configure domain forwarding, do a google search for your domain name provider followed by ‘domain forwarding’. For instance, you would search for NameCheap domain forwarding or GoDaddy domain forwarding. I already did that, I can’t configure much, only the cname to redirect as it was a wix site domain, is there any way to include it into the same ssl I already use? I’m not aware of what types of restrictions Wix puts on their domain names. It appears to be working correctly. When I visit decenmuebles.com, I get a redirect to decen.com.mx. Assuming decen.com.mx is your preferred domain – everything is working properly, and no – you don’t have to re-do the tutorial for decenmuebles.com. But could you try with “www” http://www.decenmuebles.com in safari? I just opened it on another device, using “www” and “http” – and it still redirected to https://decen.com.mx. I think it might just be your Safari’s cache. Hello, how can I install an SSL certificate on lampstack? This is a tutorial for LAMP stack. I have 2 versions – the version you’re viewing now is the Bitnami version, and there is also a version for the Click-to-deploy version. Both of these tutorials are for LAMP stack (Linux, Apache, MySQL, PHP). Check out CJ’s solution that he posted here. But I verified and it’s not a Syntax error. Actually, cert.pem does not exist. I hoppe you can help me to solve. Hello,great tutorials,but i have problem,when i add static address and domain and ssl,and in some point website don’t work.Installing order is next,add static ip,point domain,add ssl .Can’t figure where is mistake,can you advice me.Have other website,works fine with these steps. Currently using aws wordpress bitnami. I have tried so many times to install certificate according to your instructions but it’s not working. Are you using the correct tutorial? 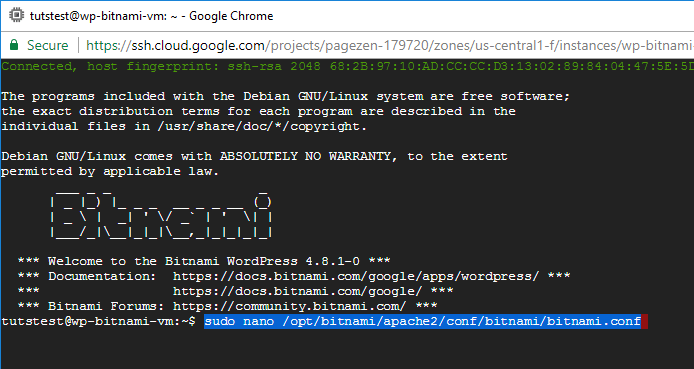 /opt/bitnami/apps/wordpress/htdocs/ is the webroot for the Google Cloud Bitnami LAMP stack. The webroot for the Click-to-deploy version is /var/www/html and that tutorial can be found here. Actually I am using Amazon aws wordpress manage by bitnami. Hi Leron, I find you on YouTube video to configure my domain on Amazon. I start to use a Lighsail and you help me a lot! Thanks! Now I’m trying to configure a free SSL certificate on Lightsail. This is possible? Thanks! I have not used the AWS Lightsail service so I’m not sure whether or not it is possible. I would recommend doing a Google search for “letsencrypt lightsail aws” and see what you find. I just ran the search myself, and there appears to be numerous tutorials on the subject. I followed your tutorial and everything worked perfectly. Can I simply change the files that were pointing to domain.tk for domain.com? Unfortunately that won’t work. Because the certificate was issued for the .tk domain, it will only work for the .tk domain. If you try to use that certificate with another domain, you will see an SSL ‘mismatch’ error in the browser. You will have to change all of your files to reflect the new domain name, and then re-issue the SSL certificate for the new domain name. Easiest thing would be to start from scratch, but you can always work backwards if you feel you have a good grasp on how the configuration works. The error means that there is an error in your crontab file. In this case, it appears to be a formatting issue (incorrect characters/formatting). 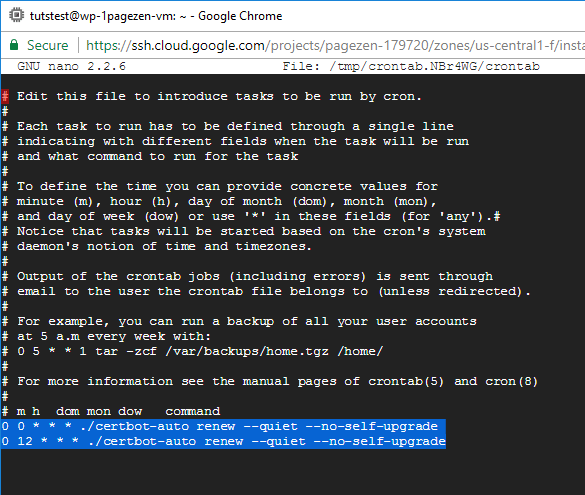 Go back through the cron section of the tutorial and verify that your crontab file is configured as shown in the example. Also, please check out the following resource for additional information about the bad minute error, and this resource for a basic outline of cron and how it works. 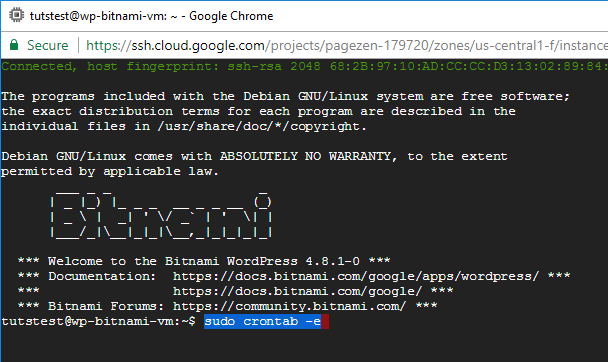 sudo crontab -e is the command I got stuck on. When you run the sudo crontab -e command, it opens your crontab file. The output that you pasted in your message is simply the default text contained in the crontab file. You will need to paste the auto-renew script at the bottom of the default text, and then save the file. 1. Which of the two IP addresses generated my the deployment should I use is the one linked to the frontend or the one linked to the database and backend? 2. The installation on either IP addresses Aborts when I am generating the Certicate, specifically when I enter Y for yes for the installation to continue, the operation suddendly Aborts. How do I address this issue? Hello, I followed the manual, and it works. Although at the time of auto renew fails, and I have to rebuild the certificate. I’m obviously in wordpress and bitnami. why? And what code I have to implement to forget the certificate. You don’t need to create a new certificate. Follow the instructions in this tutorial to configure auto-renewal for your certificate. 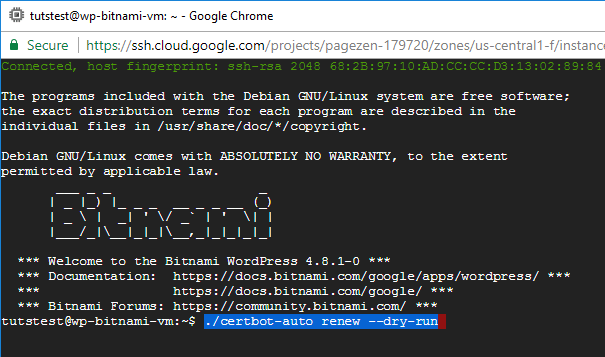 If your certificate is already expired, execute the ./certbot-auto renew command from the directory where certbot is installed. For example, try executing the command right after you finish with step 2. Your certificate (or certificates) for the names listed below will expire in 20 days (on 21 Dec 18 18:45 +0000). Please make sure to renew your certificate before then, or visitors to your website will encounter errors. Seeing me forced to do the whole process again. After doing this, try the auto-renew testing command again and see if it works. I have performed the steps indicated to me, placed in the directory I installed cerbot in that directory. I have to assume, that now the certificate is correctly configured, and I do not have to worry about it anymore. That looks good – the renewals should work just fine. Check back about 20 days before the certificates are due to expire to ensure that the auto-renewal script is working correctly. Hi Gergely – I’m glad to hear it worked! Thanks for the feedback! Did you want your new domain name to link to the same website as your other domain? Did you want it to link to a subdirectory of your website? There are many, many different ways of configuring multiple domains for a single website. And as far as encryption, it is best to add all of the domains to a single certificate, so that all domains on your server are utilizing the same certificate. I think you’re allowed to add upwards of 100 domains to a single certificate. I hope this answers your question. If not, please provide additional details about which type of configuration you’re going for and I will do my best to help. Great. I’ve already setup ssl on one domain name on my WordPress setup using your tutorial. So, do I only need to run the code you provided for domain #2 (scottjones2.com in your example) and it will be added to what I’ve already setup? Yes – that will add SSL to that domain, however you still need to configure it with your server. Just like with configuring the first domain, you need to configure another Apache virtual host for your new domain. Check out this resource and this resource to get a general idea of the process. Thanks for this tutorial! It helped. May I ask how will I be able to access the private and public key as well as CSR of the SSL installed? I am trying to set up a CDN in Google cloud and I was prompted by these questions. Glad to hear it Albert! You can access them directly in the SSH terminal as root user, then copy and paste their contents. Hi, Big thanks for getting back. Can you help me with the path of where it is installed? to swtich to root user. in the third command it will be fullchain or chain only ? The third command is chain only – not fullchain. I have used this guide before and had no issues at all, but I just tried to configure SSL for my new website and I am having an issue. After restarting the server, my site was loading with no problem (however, “https://” was in grey and not green), and about 5 minutes later it will not load at all. The SSL is fine, it’s just that your website is serving insecure content (see part 1 of this tutorial) from your website’s IP address instead of it’s domain name. Make sure that you update your WordPress site URL’s in your WP config file (step 7 of this tutorial). Then refresh your URLs by going to Settings > Permalinks – then selecting the post name option (click the save button twice again, even if it’s already set to post name setting). Once again you have saved the day! The mixed content was the issue. I had to fixed the urls for all of my pictures and now every page is properly secured. Hi Joe, sorry to bother you again. After last night, the website was loading perfectly and with the green padlock. But this morning the same thing has happened, where the site is loading the domain host page and is also not secure. My URL’s are correct, but I can’t get into my site to check mixed content and permalinks (even though these were working perfectly last night). Any ideas? The website is loading without issue on my end. Also, it appears to be configured properly based on this result from SSL checker. I’m assuming this means you were able to resolve the issue? See if that displays the location of the error. Hey Vu – I’m happy to hear that you were able to complete the tutorial! Thank you for your outstanding tutorial video. It is very helpful. Over 3 months ago, I followed your instruction to obtain a free SSL certificate and set auto renewal for trendyls.com. I wasn’t sure the auto renewal set up properly. However, the trendyls.com certificate was expired 3 days ago. I followed your instruction again, It granted the Certificate valid for the next 90 days but it fail the auto renew. I got the syntax error in bitnami.conf as described below, I have no luck so far to correct it. Please take a look and give me some instruction. Make the suggested change, restart your server, and the problem should be fixed. Hi, is there any tutorials for wildcard domain configuration? There are no Wildcard tutorials available as of now. However, it could be something that I will look into in the future. Hello and thanks for this info, I love your blog! I do all, but I use a SSL really simple pluguin and it not run. yoast by seo not run. You will have to change the permission level of your wp-config.php file to 755, as shown in step 3 of this tutorial. If that doesn’t work, you may have to use 777 instead of 755, or better: verify that the file has the proper owner. You can learn more about the chown command and Linux file ownership here. Mixed Content: The page at ‘https://www.printzx.com/’ was loaded over HTTPS, but requested an insecure image ‘http://demo.themeum.com/wordpress/wp-megamenu/wp-content/uploads/2017/07/brand-logo.png’. This content should also be served over HTTPS. This is the error in my website when i upload free ssl certificate google cloud . Can you tell me how to solve this problem ? Check out step 1 of this tutorial. Beautiful job with the tutorials. really loving them. Just to let you know + if you are able to suggest a way out of my troubles: I set up the ssl certificates according to your instruction – they worked but I didnt get the green lock yet – I came back a few hours later to continue with your tutorials and Google cloud was telling me I needed to resize my VM instance – I did it and.. Apache no longer starts. So I cant move forward there at the moment either. Have you ever come across anything similar – its definitely the resizing that threw my set up off. In most cases you won’t need to resize your VM – the micro machine is fine for 99% of WordPress websites. Next, what is the error message you see when you try to restart Apache? Thanks for the reply – I reached out to someone on my inhouse my support team and they managed to get the apache back and running again – as soon as I get confirmation on what they did I will comment here for everyones benefit. We had to upgrade as we are building a prestashop in addition to the wp site and even if we arent at the very limit now (google cloud was suggesting we upgrade) they idea was to get set up on the micro level and near launch upgrade.. Anyways Love your blog and the advice here, you are addressing a great niche and expect that if your business hasnt totally blown up yet it is ikely to do so, such quality is the material, sure to attract loads if traffic. Well done & thanks! Thanks for the feedback. Also, I am glad to hear that you were able to get the issue resolved. And I didn’t realize you were going to be running on online store, in which case a more robust machine would be appropriate. Thanks for the update with the solution! I am happy to hear that you were able to get your system up and running again. Please I have an issue after following your tutorial. thank for the tutorial first. After configuring my SSL cerftificates succssfully, I received a message from Certbot saying my certificates will expire in a few days. Thoug I set automatic renewal. I dont understand why. I assure you, I went through your video tutorial, and you post, followed everything as you said but I still have that issue. Follow this tutorial for updated instructions on how to configure auto-renewal for your certificates. Try CJ’s solution of changing the permissions of the letsencrypt directories. If that doesn’t work, go back to line 54 of your bitnami.conf file and make sure there are no spaces at the end of each line. Also, make sure sure there are no spelling errors on either of the 3 certificate paths (extra quotation marks, etc). You are awesome. Actually awesome! I’m working on a website. Following your tut, I just made it safe. Next step should be managing content in the site. 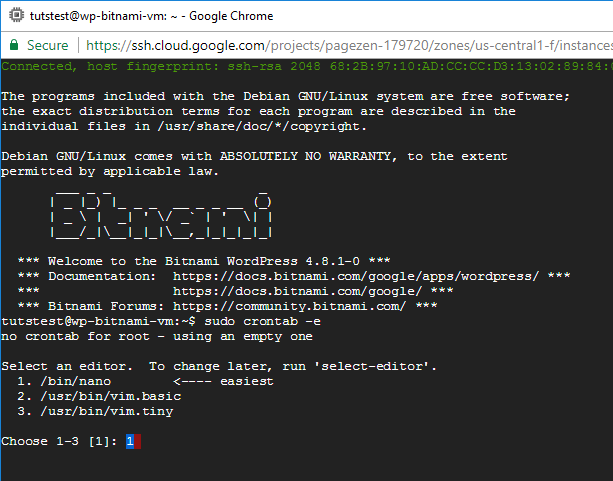 Do you have any related tutorials concerning customising WordPress website (bitnami) on GCP? I’m glad you were able to get your website running on Google Cloud. I don’t offer have any front-end tutorials for WordPress, but if you do a Google search, you will find thousands (if not millions). Leron i am using lamp stack on my engine, therefore i changed wordpress to apache and apche2 as well but no luck resolving the error. The error message is saying that the directory /opt/bitnami/apps/apache/htdocs/ doesn’t exist. From my understanding, if you’re running your application on a standalone Bitnami LAMP stack your webroot is /opt/bitnami/apache2/htdocs. sudo nano /opt/bitnami/apps/wordpress/htdocs/wp-config.php. after changing it to sudo nano /opt/bitnami/apache2/htdocs/config.php blank screen appears. If a blank screen appears it means that the file does not exist, and therefor it created a new empty file at that location. Word of advice: if in doubt about whether a file exists at a certain location, use the cd command. 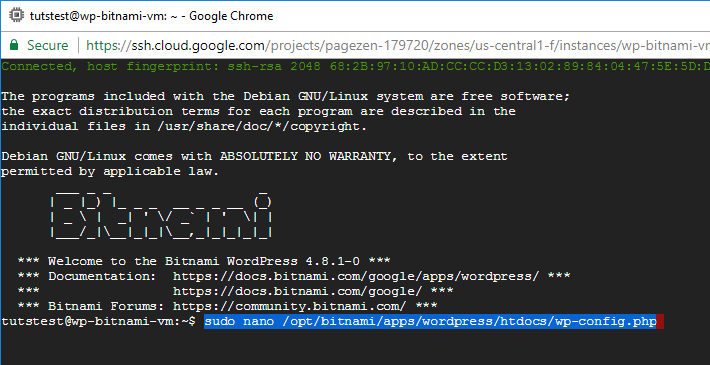 For example, if there is in fact a wp-config.php at the location /opt/bitnami/apps/wordpress/htdocs/, then it will show up when you enter the command cd /opt/bitnami/apps/wordpress/htdocs/. If not, it will show a file not found error. Get familiar with using this process as it will save you a great deal of hassle down the road from entering invalid file paths. Also, check out this tutorial on Basic Linux Commands for Google Cloud – this will help you get comfortable with navigating the Linux Shell, and will help a lot in the future with configuring your websites in the cloud (the Linux Shell is universal across all cloud platforms). Hi thank you for your blog. I have gone through all instruction and it works fine and perfect. However I can’t login to phpmyadmin, do you know how to fix this issue? For Bitnami stacks, you have to access phpMyAdmin via SSH tunnel, which I demonstrate in this tutorial. First off VERY Clear & Great Videos! There is an error on line 10 of your bitnami.conf file, specifically on the line with the ServerAlias directive. Go back to step 6 of the tutorial and make sure the three lines starting with ServerName are configured properly. Hey, Love your site and al your videos by the way. I recently setup the SSL for Bitnami on Google Cloud and My website does NOT always load the GREEN SSL LOCK. How do I fix this issue? Sounds like your website is serving mixed content, thereby causing a ‘mixed content’ error. Try looking over this tutorial for a solution on how to fix ‘mixed content’ errors. If you’re using a Bitnami stack on AWS, the instructions will be nearly identical. Before starting, however, make sure that you have an external IP address assigned to your AWS WordPress instance. Make sure there aren’t any spaces at the end of the certificate path on line 51 (and for the other two certificate paths) – this is probably what is causing the error. I’ve followed your tutorials for WordPress on AWS and it helped me alot. Thanks for the very detailed explanation. Can you make a tutorial for installing SSL Certificate for Wordpess in AWS with bitnami just like this one? I will make an AWS SSL tutorial in the future. That being said, the configuration for the GCP and AWS Bitnami WordPress stacks are nearly identical, so you should be able to use this tutorial to configure SSL on AWS. If you try it and run into any issues, let me know and I will see how I can help. Leron, Thanks for this great tutorial. I already setup SSL successfully and everything is Ok except accessing to phpmyadmin since I’m using wordpress bitnami on GCP I have to get access to phpmyadmin through http://127.0.0.1:8888/phpmyadmin but it redirect s me to main domain e.g https://www.1pagezen.com. Just as a note After finishing tour tutorial to get access to phpmyadmin locally I followed https://docs.bitnami.com/google/components/phpmyadmin/ also I had access to phpmyadmin before setting up SSL on my website. At the end of step 4.5, were you able to create the SSH tunnel (see the black terminal showing the Bitnami text)? What is your domain? If you don’t want to provide it, make sure to run a check with an SSL Checker to make sure you have both the www-version and non www-version of the domain listed in your SSL certificate. Leron, Thanks for reply but to clarify again I have no problem with SSL it means already setup successfully but not able to access to bitnami phpmyadmin as I mentioned. Please check the bitnami link I posted before for accepting to phpnyadmin which is only possible on localhost. Are you referencing your server logs? Try using Chrome browser and accessing localhost and choose the “proceed anyway” option when the browser warns that the SSL certificate is invalid. This error is expected as localost is not listed in the SSL certificate, and therefor will show a security warning by default. Also Mehran – please create a new comment at the bottom of this tutorial page, and I will assist you there. This tutorial page is for SSL certificate troubleshooting only. I want to go to google cloud but i have it hard fining a cost for a simple wordpress website hosting, can you give me a rught idea the cost to host a site like yours? You could run a website like onepagezen.com for around $2-5/month using the most basic settings. That being said, remember that this is not a data intensive website (no stored user account data or video), so the storage/networking costs are low. Thanks for your response, so your saying i should just select the basic options when signing up? my site is under 500mb when i use all in one migration, so i beleve its very small. What I would recommend is that you start with the most basic option, and then if you’re experiencing issues with performance, you can always upgrade (see the performance graphs at the top of your GCP dashboard). Did you get the error resolved? What is the full renew command that you’re executing? Don’t add that to your bitnami.conf file, you don’t want all your sub domains redirecting to the main one. If you’ve installed it before it would notify you asking if it should expand the certificate. Just enter the code for yes… and you are done..
Great tutorials – very clear and well documented. 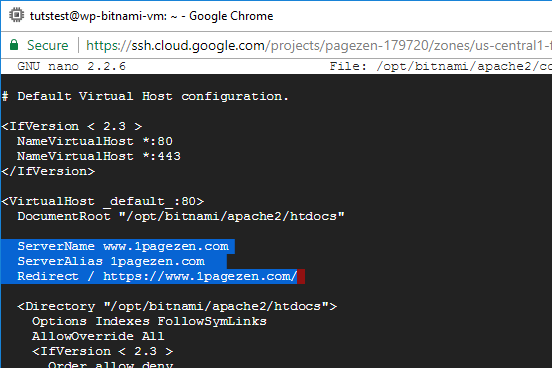 I’m wondering if you could provide alternate instructions for Step 6 of the “Free SSL Certificate Setup for WordPress on Google Cloud (Bitnami)” tutorial specific to the nginx server rather than apache. 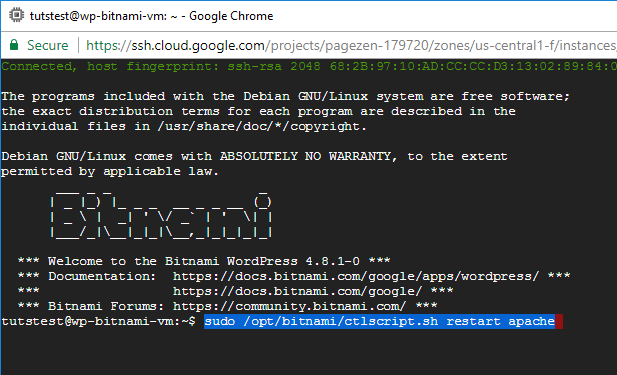 I’ve deployed Bitnami’s “bitnami-wordpresspro-dm-fa11” which is WordPress with Nginx and SSL for Google Cloud Compute Engine. The settings for nginx will be a little different than those for apache. I’m trying to intuitively figure it out, but so far I haven’t successfully mapped the calls to the certificates to the correct location in /etc/letsencrypt/… so my site isn’t secure yet. Unfortunately I won’t be doing any Nginx tutorials because Apache is the default server for most of the stacks covered in these tutorials. That being said, I would check StackOverflow for troubleshooting and Digital Ocean for some great Nginx tutorials. and had mine up and running. Ive followed this bitnami tutorial but it didn’t work for me. would you have any other tutorial stetp by step? I encountered other problems so I went back to using Apache servers. Let’s Encrypt Expiry Bot, is it normal? Is it going to renew automatically? The auto-renew script from the first version of the tutorial didn’t seem to work for most people. 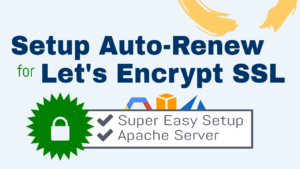 For this reason, I created an updated tutorial that focuses specifically on how to configure auto-renewal for Let’s Encrypt SSL certificates, and you can view that tutorial here. Please reach out to me if you have any questions or encounter any issues while going through the tutorial. I will try this other tutorial! Sounds good – let me know if you have any questions! Hi, thanks for the great tutorial. I found the solutions before you approving my comment. please tell me can I use the below code. I have static IP address in order to eliminate duplicate code I wrote code like this. As of now everthing working perfectly. I have placed this code to force https in bitnami.conf file. And I also found this code but It doesn’t redirecting to my ip address to domain. If it is working for you, then go ahead with it! Also – You shouldn’t run into issues with Google Crawling your website’s external IP. If your DNS records are configured properly (according to the tutorial), your browser will automatically redirect from your IP to your domain. I think there were character missing errors on my latest post. 8. Restart your Apache Server step. Thank you for your good introductions. I had success of the SSL Certificate Setup on my MAIN domain. Then when I tried the process again on my SUB domain, I got the SSL Certified SUB domain. But unfortunately, my SSL Certified MAIN domain came back to Non-Certificate state, instead. for both my MAIN and SUB domains. You should only have one certificate – and in this certificate, it should include every domain and sub-domain you will be using for your website (maximum 100). Then how can I apply the only one certificate of main domain to a sub-domain. how can I apply it to a sub-domain, subzen.1pagezen.com ? Can you answer the steps in detail for the procedure? Configuring sub-domains is not a simple process. DigitalOcean has great tutorials on the subject if you would like to look into it. Also, if you’re going to be configuring multiple WordPress websites on individual subdomains, I would recommend using Bitnami’s WordPress Multisite stack. Check out their documentation here. Thanks again for your fab tutorials. A definition of a siteurl or homeurl was detected in your wp-config.php, but the file is not writable. Set your wp-config.php to writable and reload this page. Any help of how to do this would be appreciated? Also forgot to ask is this the reason the images are missing? The image problem could be related to insecure content errors, see this tutorial. If you can’t figure out the issue send me your site URL and I will take a look. In order to use a plugin such as Really Simple SSL, you would have to change the default permissions of your wp-config.php file to writable. Although this isn’t a recommended practice for security reasons, it will in fact allow the plugin to write to your wp-config.php file. Saw this and not sure if this helps… After Rachel has done the previous steps of course. But great fast (smart) way to fix for SEO audit purposes is the Broken Link Checker plugin (By Janis Elsts, Vladimir Prelovac) that runs on my website. You may find/have a similar one but this is what I use. Great thanks Joe, I had a feeling that was the case. Not sure if i’m comfortable doing that. Thank you again. Rachel. My certificate recently expired–I was getting warnings that it was about to expire, but I thought the auto-renew process would take over. I had set up the auto-renew process as you recommended. I’ve re-run the process you recommend in the tutorial. Is there a way to test the auto-renew process? Thanks for all of your education! I’m sorry the script isn’t working for you – it hasn’t worked for some other people so I will look into it. I will notify you when the script it updated. Same issue for me as well. Did not auto-renew, and was throwing security warnings to users until I noticed. The command above fixed it, but I too would love to be notified of updated auto-renew cron. Thanks again! I am aware of the issue and am currently working on a solution. I will send out on update via mailing list and will update the code on the tutorial. Okay thanks Joe, I see the differnce from previous SSL certificate install (Bitnami). Clearly it starts with installing git vs direct link to https://dl.eff.org/ and extras (chmod a+x certbot-auto). Question I have here is, what if I want to change my website to run through this SSL certificate channel via https://dl.eff.org/ as per your tutorial here… How do I uninstall git via the ‘apt-get install git-all’ command, installed previously ? Or/And if there are any other further steps I need to do? Also, can you briefly explain what the two differences are between the two previous/current. Obviously the latter is better but why? (just out of curiosity and for anyone who installed it via git and is reading this he he he) I know I’m a pain, sorry. The idea behind the second tutorial was simply to make it more ‘streamlined’, and to clear up some of the inefficiencies found in the first edition. Also, there was a mistake in the first edition of the tutorial, wherein the Certbot repository was being saved to the /tmp directory, which automatically clears over time. And you’re not a pain! – I am sure several other people have had this same question, however, you’re the only one who mustered the courage to ask. In the first edition of the tutorial, Git is downloaded to your home directory so you should be able to access the files by entering ls after connecting to your instance via SSH. Wishing you a wonderful 2018 as well! I’m not sure why because I added the 3 paths as per your example but is looks like something to do with the SSL certificate file paths. Pls let me know what you think and any possible direction for a solution. Contact me through the OnePageZen Facebook page and send me a screenshot of your 3 lines as they are listed in your bitnami.conf file. 12/29/17 UPDATE: To fix this problem, make sure there is not spaces after either of your three certificate paths listed in your bitnami.conf file. Have installed a moodle (bitnami) instance on CGP, reserved a static ip address, and transfered a domain name so all going good so far! I have a question at 3. Generate Certificates. of your tutorial. What would the command look like when creating a certificate for a moodle (bitnami) instance? I just realise that the following command in your example is going to be incorrect! So I am confused. Could you please help me out a little here? Would i just need to replace the text “wordpress” to “moodle” in the first command snippet above? Also, don’t run the Open SSL command; that’s for issuing self-signed certificates and is irrelevant to this tutorial. You are on the right path! Let me know if this answer doesn’t make sense to you or if you have any questions! Everything going well…and up to Step 7 Update Domain URLs but have hit an issue! So I just removed the “wp-” extension and left the config.php file as seen below. But I don’t see the define example listed but I do see similar code for the domain. if i added my domain here “www.hocvietngu.com” which part of the line would i need to remove? Would this line be correct? with apostrophe and semicolon? Use the following code, however, make sure to use the ‘ character by your escape button on your keyboard, not the ‘ by your enter key. You are installing SSL according to the tutorial you have created. However, it can not be executed in the steps below. all arguments you have provided. Help for certbot itself cannot be provided until it is installed. All arguments are accepted and forwarded to the Certbot client when run. This is not an error that I have come across before. What you should do is open a support ticket on the LetsEncrypt forums and see if one of their developers can help you. This means there is an error in your bitnami.conf file on line 68. So you will need to open the file and check line 68 for an error. Use CTRL + SHIFT + – in order to jump to a specific line once you’ve opened the file in Nano. the rest procedure is exactly same with that of the main domain steps except for the domain name ?? If it is different, can you introduce it for subdomains in detail like this website(for main domain) ? That is correct. 🙂 You just need to list the subdomains in the certificate, just like you would list your primary domain. You are allowed to list up to 100 domains / subdomains in a single certificate. for WordPress websites(domain and sub-domains) of a small “commercial enterprise” on Google Cloud Platform ?? You will have to look over the policies and legal repository for Let’s Encrypt and also the Certbot license conditions. Thank you very much for your kindness support, I would not able to do anything if I did not see your video and tutorials. Yesterday I moved my site to Google Cloud and it takes over one day to do that. It was really tired. 1. My site after setup the SSL certificate, it still appears the sign that is not secure 100% (images..) How can I fix that? 2. I was built the Bitnami WordPress, but that platform seems to conflict with the W3 Total Cache, so now my site speed on Google Speed Check even a litter bit slower. Is there any way I can fix it? Or can I remove the Bitnami Speed Check on my site? Thank you for your kindness sharing! You website is serving insecure HTTP images – this is a very common problem with SSL, and is easy to fix. Check out this tutorial to learn how to fix the problem. Also, either W3 Total Cache or WP Super Cache works better than the other on Bitnami installs – but I forget which one it is. If W3 isn’t working for you, I would give WP Super Cache a try, or else check out the section of Bitnami’s documentation dedicated to configuring W3 Total Cache. Thank you very much for your time and your advice yesterday. I follow your instruction and I already fixed the insecure HTTP image. Again, thank you very much for that. For example, below is the warning when I installed W3 Total Cache. I read the instruction from https://docs.bitnami.com/google/apps/wordpress/ but I cannot edit because simply I do not know how to do it. If you could make a tutorial about this, I think many viewers will see. Because I searched on the internet, this matter has a very poor instruction. 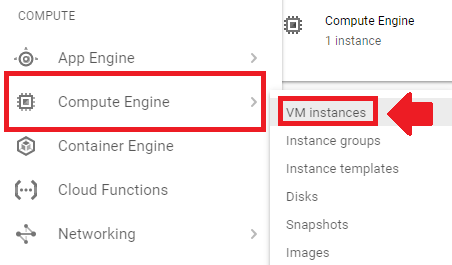 In Google Cloud, you will need to click on the SSH button next to the instance that is running your website in order to connect to it. Next, enter the command sudo nano /opt/bitnami/apps/wordpress/htdocs/wp-config.php to open up your wp-config.php file. Next, press CTRL + X at the same time, then press Y to save changes, then press “Enter”. The problem is I do not know how to change it. It seems that there are multiple issues at play. What you should do is open a support ticket at the Bitnami Community forums, and describe your issue in detail. The Bitnami engineers will know exactly how to fix the problem. In the meantime, the solution you’re looking for is probably something similar to Beltran’s response in this thread. Can you instruct to me some commands to find show the .htaccesss.conf on SSH mode? I got free SSL for my site with this method. Once again thanks for this!!!!!!!!! I am glad to hear the tutorial was helpful to you! Hi Leron is there no requirement to make changes to /etc/apache2/sites-available/default-ssl.conf in bitnami wordpress? You don’t need to do anything with the default-ssl.conf. I done install it, but i want change that will comodo. and How to Uninstall it ? Just put a # sign next to the certificate file paths in the .conf file, or delete them. You can delete the Certbot and LetsEncrypt files and directories by using the commands from the Linux commands list. can you help me master? I only offer support for configuring Let’s Encrypt certificates as shown in this tutorial. If you’re curious on how to install Comodo certificates, check out this tutorial. Worked perfectly, thank you so so much! Great tutorial! I got the SSL to work on my main site. Just wondering how I go about setting up SSL to work on subdomains and mapped domains that exist now and in future when I add more mapped domains? rocketwebber.com is my main domain running on multisite. rocketwebber.com has an A record: example1.rocketwebber.com that points to the IP for rocketwebber. For securing multiple top-level and subdomains in a multisite installation, you will have to install the Domain Mapping plugin. Also, check out the Bitnami Multisite documentation about how to properly configure SSL. Configuring multiple domains with SSL on single virtual machines is complicated and usually takes some trial and error. Anyways, check out the link above, it should point you in the right direction. Let me know if you have any questions. So followed the tutorial, everything seemed to work perfectly. It shows in wordpress, https:// mydomain.com secure. 2. None of the common names in the certificate match the name that was entered (www.mydomain.com). You may receive an error when accessing this site in a web browser. Learn more about name mismatch errors. As it shows the cert has been created but it still shows up in the browser that it url is insecure. Wondering if anyone has had the same problems before? Awesome tutorial! I would like to add subdomains to my domain and get the certbot to issue a cert for both the domain and the subdomains. Is the easiest way to just add the domains after directory like so: -d domain.com, subdomain1.domain.com, subdomain2.com and so? I follow your step but unfortunately my website is totally down and not opening while i try to install ssl certificate. Please help me out i totally helpless. I try my best to resolve my issue always facing same issue that create A/AAA record i already created all the records but i unable to install ssl certificate and also unable to open my website. Please help me out this. You have misspelled tech1one in your certificate issuing command. Fix that and you likely won’t see that error anymore. Actually misspelled only here on my comment but when i write the code on VM Console i write exactly my domain name. While issuing certificate always give same error message. The causes of the error are likely that your DNS is not configured properly, that your Domain hasn’t resolved to your new website on GCP, or that the certificate issuing command isn’t being executed properly. What I would do is go over the links at the top of the tutorial page and make sure that you completed each of the 3 pre-requisite tutorials successfully. Check for any errors etc. You may also have to do some troubleshooting on StackOverflow and Google. I would love to see these tutorials continue with setting up Google Cloud CDN! I change the domain of my site, and I’m getting troubles to install a new ssl cert because the older domain cert.. How I remove this to install a new cert?? You can simply redo the tutorial: the Certbot client will ask if you want to overwrite your old certificates – choose “Yes”. Also – make sure that when you re-do each step, you use your new domain name and not your old one. Are you using the right tutorial? Remember there are both Bitnami and Click-to-Deploy tutorials. If you are using Click-to-Deploy, you need to make sure that all future tutorials are designed for Click-to-Deploy. The same goes for Bitnami. Everything is normal now…. Buuuut at /wp-admin appear not secure. It is usually caused by an insecure content error, as shown in step 1 of this tutorial. As the tutorial shows, you will have to inspect the page and see which element is causing the error. This is the full step i go through. Please take a look and see which step i go wrong. IMPORTANT NOTES: – Congratulations! 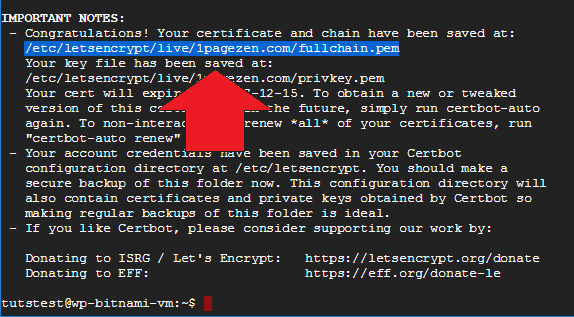 Your certificate and chain have been saved at: /etc/letsencrypt/live/badmintonvillage.com/fullchain.pem Your key file has been saved at: /etc/letsencrypt/live/badmintonvillage.com/privkey.pem Your cert will expire on 2018-01-01. But Eventually couldn’t Work properly. It mentioned that letsencrypt/live/ badmintonvillage.com/cert.pem’ does not exist. All of the text that says mydomain.com needed to be replaced with you own domain name, which in this case is badmintonvillage.com. You will need to go back through the tutorial and fix steps 6 & 7 and make sure badmintonvillage is listed in the place of mydomain. The folder should show around 4 certificate files, one of them being cert.pem. I have updated the domain to badmintonvillage.com & redo configuring the certificates & update the domain URL. I need you to copy some text and send me it to me. Please send me all of the 6 lines of code as they appear in your file. I will look over the code and make a recommendation from there. The situation now is my web will auto show https, but the green lock doesn’t show up. Redirect / https://www.badmintonvillage.com/# Default Virtual Host configuration. I ran an SSL report on your certificates, and it’s showing that your certificates were issued for example.com. The above command is from step 3 of the tutorial – it’s the only step you need to repeat. You won’t need to change anything in your bitnami.conf since the file paths will remain the unchanged. Let me know once you’ve done this. Requested name http://www.badmintonvillage.com appears to be a URL, not a FQDN. Try again without the leading “http://”. The domains in the command that I sent you SHOULD NOT have an http or https in front of them. Annoyingly, the http and https prefixes are added automatically when posting comments on WordPress. Try re-issuing the command but make sure the commands after each -d DO NOT include http or https, simply with www or without www. I have removed the HTTP / HTTPS on the command. The web still cant access SSL while the result said that Certbot can obtain and install HTTPS/TLS/SSL certificates. Try again, but this time copy and paste the command from the tutorial itself, don’t copy and paste it from my comments. The comments on WordPress aren’t formatted as standard HTML (which is what is in the grey boxes in the tutorial); that’s why the “-” symbol in front of webroot isn’t being recognized by your SSH terminal. I type the command: ./certbot-auto certonly –webroot -w /opt/bitnami/apps/wordpress/htdocs/ -d badmintonvillage.com -d http://www.badmintonvillage.com and it required me to reset the certificate, and i click yes. However, still not works for getting the SSL. After putting the restart command, i put the step 3 command again. And then restart again. Still cant access SSL. Your certificates are still not showing up as configured properly, but I know that isn’t the case because I’ve ruled that out. For this reason, this points to an error in your Apache configuration, possibly in your bitnami.conf file. If you’d still like support, please send me the entire contents of your bitnami.conf file and I will take a look at it. Please send it to support@onepagezen.com. Hi Leron, I am having the same issue as Peter on all my sites I try to do this with. Are you sure its not an error with the tutorial? I’ve worked through this tutorial several times, and it works fine. However, the last time I ran through the tutorial I encountered the issue that you described and the way I solved it was by changing the permission level on the certificate directory. I will run through the tutorial again and see if I can reproduce the issue to give you a more thorough documentation on how to avoid/fix it. What permission level did you set the certificate directory to? I’m currently having this issue. Would love to get this solved. My SSL is now active. Hope this helps someone. Let me know if this looks okay, Leron. Looks good – I am glad you were able to get the issue resolved. Did you change the file permissions initially? I’m interested because this isn’t an issue that I see regularly. This syntax error is usually caused by there being extra ‘spaces’ after your file paths. So go to line 58, where each of your 3 certificate file paths are listed, and make sure there are no extra spaces after each of the 3 file paths. Not that I recall, haven’t changed anything since I originally set it up. Thanks for letting me know CJ! Hi, thanks very much for the helpful tutorial! When trying to obtain a new certificate, I got the following error. Any help is appreciated. Using the webroot path /opt/bitnami/apps/wordpress/htdocs for all unmatched domains. Joe, I also did your tutorial on domain name configuration and did that work and everything went fine. I’m noticing a thread there “From Google Cloud Platform dashboard, go to cloud DNS. Check your IP address of your A record. Go to your VM instance page, look at the IP address of the VM instance that is running your WordPress website. Do they match?” I’m using the Bitnami click to deploy app. I don’t have a cloud DNS zone. Let me know if that’s part of my problem. Thanks. My domain registrar is Google. You need to have a DNS zone that is managing the IP/domain that is running your instance, as shown in this tutorial. What the certbot error is essentially saying is, “the nameservers of this domain aren’t connected to your Google Cloud Platform account, so for that reason you don’t have permission to issue certificates for that domain”. Take a look at the tutorial that I sent you in the link, and after you’ve completed that let me know if you have any questions. When you changed your name servers on Google, you basically opted to manage your domain name through Google Cloud DNS instead of through Google domains. I think the issue with your website not loading likely has to do with your nameservers and DNS not being configured properly. In addition, make sure your WordPress domain name URLs are set to globalcare.com or http://www.globalcare.com. StackOverflow is also a great resource to use when troubleshooting a DNS configuration. I sent you an email requesting images from your Cloud DNS, Google Domains DNS, and Cloud VM instances page. I will take a look at the images to see if there are any basic issues that can be quickly and easily resolved. All set up with a SSL Cert and G Suite functioning well. Thanks for all the help! Let me know if you ever have questions or suggestions for future tutorials! I have connection via sftp but the problem is probably permissions. I can see the files but I am able to download only some of them but not the keys. I am afrate if I change the permissions to sub files and folders they may be different permissions in each of them. I am afrate to not mestup all of them. What you could do is just change only the permissions of the file that you want to edit, within the SSH terminal as shown in this tutorial. Change permissions to 777, download and edit the file (or whatever you want to do with it), and then change the permissions back. Where ssl certificate store in google compute wordpress Bitnami. I want installed ssl certificate but I don’t know where is save certificate. I’m installing certificate suggested step by you. please Email me root name where ssl store. 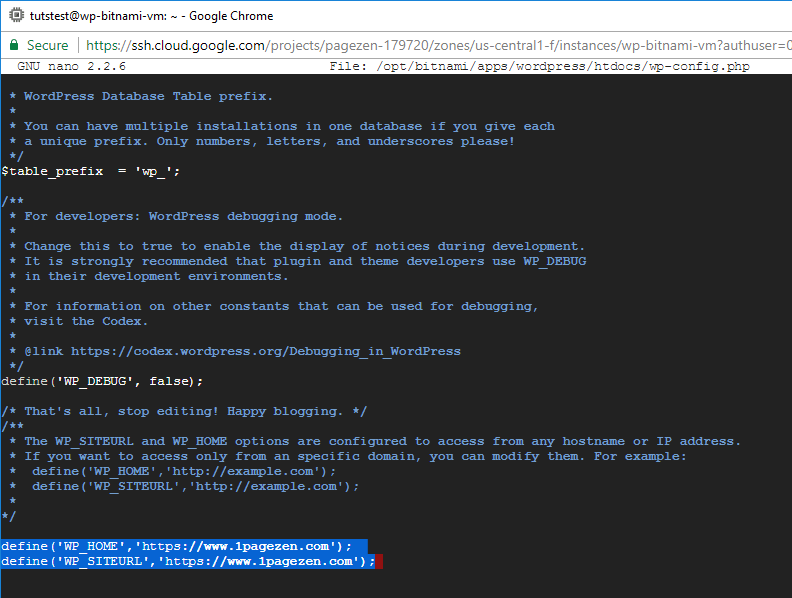 and please suggest how to enable google cdn for compute engine (wordpress by Bitnami) & setup Load balancing……. The load balancing and CDN tutorials are in the making. They’ve been difficult tutorials to simplify, so that’s why they are taking awhile to make. Stay tuned, and make sure to join the mailing list to be notified when the tutorials are released! Remember to replace YOURDOMAIN.com with your own domain name. 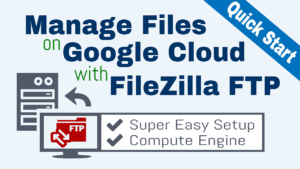 If you want to download the certificates, you can use an FTP client such as FileZilla to locate and download the certificate files (see this tutorial). thank you for you great tutorials! Everything works just fine! Thank you for you quick responds as well! I have just one question regarding ssl on google cloud. I can not backup the ssl key as I suppose to do following the tutorials for some premision reasons I guess. Can you help out with that? I am glad everything is working fine! Are you looking to backup your SSL certificate files? You can open up the files and and copy and paste the contents in to a text editor – then save the file with the correct file extension (.pem). The other thing you can do is download the files via FTP, which I set up in this tutorial. Thanks for this tutorial. It is really helpful and I will try this out. There were a few decisions that you made that prompted some questions. Such as why do you prefer to use ‘www’ when setting up your wp-config.php file? Also, should I upload all images to the site before setting up the ssl certificate or doesn’t it matter ? Sorry if I have asked you this one before but I am still a unsure how images are treated for ssl. Regarding your first question – I just personally prefer to use www. with my domains, but you can find a million arguments on the internet arguing that www is better than non-www for SEO, and vise versa. Honestly, I don’t think it matters one way or the other as long as you choose one and stick with it. As far as uploading images is concerned, I would recommend uploading your pictures after you’ve completed the tutorial, as this will save you from having to change your image URLs later on. Also, before starting the tutorial, I would recommend taking a snapshot of your instance as a backup, according to step 1 only of this tutorial. Let me know if you run into any issues with the tutorial, as I would be more than happy to help you through them. What did you think of this revised version of the Bitnami SSL certificate tutorial? Did you find it easier, more challenging, not much different?